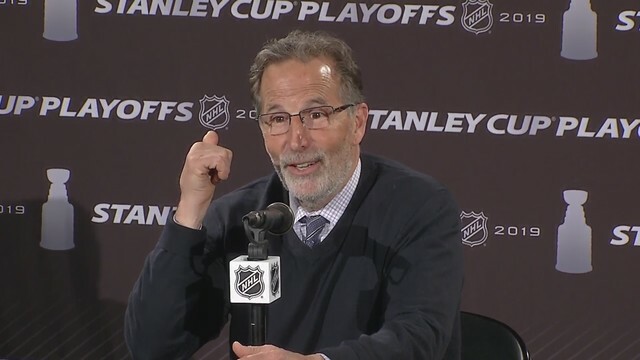 COLUMBUS (WCMH) -- Columbus Blue Jackets Head Coach John Tortorella says the fans at Nationwide Arena helped his team beat the Tampa Bay Lightning in Game 4 of Round 1 of the Stanley Cup Playoffs. During the postgame press conference, NBC4's Jerod Smalley asked, "There was a specific moment in the game, it goes 3-3, then less than a minute later you get the man advantage. And the crowd, then they went to 3-3, rose. Can you go back to that moment?" "They helped us," responded Tortorella. "They were fantastic the two nights here. And it helped us tonight. It was a game of ebbs and flows, losing a two-goal lead. That was a key moment, as far as that whole building, and we answered with the fourth goal. That was a key moment in the game, obviously." Tortorella said the fans have been great to him since he arrived in Columbus. "I'm thrilled for them, that they get to taste this," said Tortorella. "Having said that, it's only one round. And we just gotta enjoy it. The whole team has a couple days off here, then we get back to work." Later in the press conference, Tortorella did mention that during the celebration at the end of the game, and after one of the goals, he had two beers poured on him from the people behind him.